PA730 is an Android handheld computer, rugged and built to last. Built on the fastest growing and most popular mobile platform, the PA730 Android handheld device is a powerful and versatile data collection tool. Lightweight and pocketable, the 4G LTE Verizon Certified device is versatile enough for a variety of applications in retail, event ticketing, asset tracking, and inventory management. The PA730 is a powerful partner on the sales floor, helping your sales associates look up stock and price information from the warehouse and process payments without ever leaving the customer. This Android handheld's 12-hour battery and integrated scanner facilitates hospitality, event ticketing, and various mobile processes. Equipped with a 16-megapixel camera with dual autofocus and LED flash, this device is ideal for capturing digital evidence for proof-of-delivery. Broken screens and expensive repairs add up very quickly. The PA730 is built to withstand the wear and tear associated with any enterprise, all while maintaining the stylish look of consumer-grade smart phones. The PA730 Android handheld survives multiple 6-foot falls to concrete undamaged, even when landing directly on the screen. This is because we've equipped the PA730 with a Corning® Gorilla Glass® screen; the industry standard for damage-resistant cover glass. The PA730 is also sealed against dust and protected against water spills and moisture, ensuring a long product lifetime. The PA730 has been tested thoroughly: it withstands extensive vibrations and performs reliably in extreme temperatures. 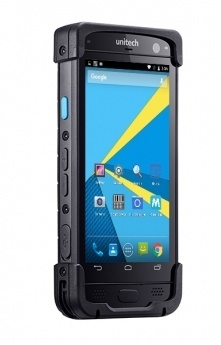 Investing in a rugged Android handheld device like the PA730 means a lower total cost of ownership in the long run. Android is a recognizable brand and easy mobile operating system. Android boasts 800 million customers nationwide, and with version 6.0, you'll have access to the latest version available on rugged Android handhelds. You will be able to download consumer-grade applications in the Play Store or use Square to process payments but also benefit from more robust application developments suitable for professional use. From an IT standpoint, you can future-proof your business by developing on HTML 5. If your business is transitioning away from consumer-grade devices, switching to the rugged and more powerful PA730 would be a smooth process thanks to the familiar Android interface. The PA730 Android handheld computer features the largest screen size in the market as well as the highest resolution, making for a vibrant display. With 5" of screen real estate, the PA730 supports information intensive applications, ensuring you can view more of your data and more of your work. The fully illuminated and sunlight readable screen facilitates outdoor applications, while the thinner and stronger Gorilla Glass® II display yields greater touch sensitivity for an easy user experience. The PA730 Android handheld computer has an integrated 1D & 2D barcode scanner that is both aggressive and accurate. The PA730 comes equipped with NFC communication, technology often used for mobile payments. With so many ways to process payments, gather barcode information, and capture data; the PA730 is the ultimate partner for any professional. **Verizon certified version arriving in Q1 2018!